It seems a little sleazy to take caffeine in pill form instead of getting it from coffee and colas, but I don’t know why it does. I pay extra for energy bars that have caffeine. Often when I buy a coke it’s the caffeine I’m after. I got to thinking why not just buy a bottle of caffeine. It’s cheap —5.00 dollars for 100 pills of performance enhancing goodness. Perfect! I didn’t know you could buy caffeine pills other than just plain old no-doze. Although aren’t you worried about becoming dehydrated by taking caffeine? I’m not sure caffeine is all that evil as far as hydration goes. 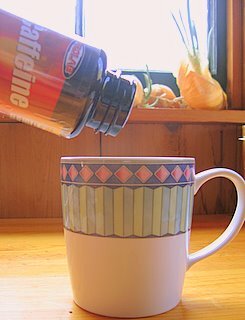 Check out this article about caffeine and dehydration. I may have to drink a little extra water. interesting article crow. although i am one of those who harbor a negative opinion of caffeine, i still use it on rare occasions and don’t fault others who seem dependent on it. it took me 10 years to figure out that caffeine (or rather the failure to maintain high levels of it in my bloodstream) was the culprit in my frequent headaches, and i also noted the cause and effect link when my body goes into a water-purge frenzy, even before reading anything on the subject. admittedly, i am biased by my past experiences and obviously not everyone is so dramatically affected by this drug, but i am curious as to why anyone would want to deliberately mess with their natural body chemistry on a regular basis, especially on the trail where re-hydration is one of the primary concerns. I agree it’s probably best to not take caffeine or any drug. But saying that, there are times when I’m just dragging on the trail and caffeine is a great help. Yeah, I guess I could just rest more and not do so many miles. But I get into the miles. That’s one of the things that makes long distance hiking so fun–pretending that you really have some place to go and you’re trying your best to get there. Last year I didn’t have any caffeine on the trail until I discovered Crystal Light with caffeine. I liked the little buzz it gave me. I also remember coming out of Truckee after drinking a large cup of coffee at Starbucks and the miles just flew by. I don’t intend to use it regularly but it may happen that I do. Having caffeine pills is cheaper than buying cokes or cups of coffee at Starbucks, and really what’s the difference. I don’t know if you have ever done a long trail but I get tired on a long trail, really tired, and need a lift some times. Also, caffeine when you have physical activity is different than taking caffeine and sitting on your couch–you are buzzed and you have a direction to focus that buzz on. I keep well hydrated on the trail; water is a great performance enhancer. Next Next post: Forest discovery.